Today's star is legendary character actor Lee J. Cobb. TCM is celebrating the career of Lee J. Cobb with 10 movies on Aug. 17. Here's what you need to know about the actor who originated the role of Willy Loman in Death of a Salesman. FYI: TCM sometimes changes the air times and /or movies, so you can go to www.tcm.com to check the updated schedule. Born: Dec 8, 1911, in New York City. Died: Feb. 11, 1976, in Woodland Hills, Calif. He is buried in Mount Sinai Memorial Park in Los Angeles. AKA: Cobb's stage name is a clever play on his birth name of Leo Jacob. Academy Awards: Cobb was nominated for best supporting actor for On the Waterfront (1954) and The Brothers Karamazov (1958). Brief bio: Cobb dreamed of becoming a violinist when he was a boy, but a broken wrist ended his musical career. Instead, Cobb pursued acting much to the chagrin of his worried parents who wanted him to be an accountant. Cobb struggled in bit parts in both New York and Hollywood until he became a member of the famous Group Theatre in 1935, where he acted in plays like Clifford Odets' Golden Boy (Cobb also appeared in the film version). Cobb served in the Army Air Corps during World War II, and he continued to play supporting parts after the war until he won the role of Willy Loman in Arthur Miller's Pulitzer Prize winning play, The Death of a Salesman. Miller wrote the part for Cobb, and the actor made it his own, giving a legendary performance that The New York Times called a "veritable landmark." Cobb soon became a sought after character actor in prestigious dramas like On the Waterfront and 12 Angry Men (1957), but he earned his greatest fame as Judge Henry Garth in the TV Western, The Virginian. Lee J. Cobb (far left) is one of 12 Angry Men (1957). Fun fact: Cobb was an accomplished harmonica player. 1. Noir fans won't want to miss Thieves' Highway (1949), airing at 8 p.m.. This movie directed by Jules Dassin features Cobb as a gangster who runs a racket in the San Francisco produce market (yes, you read that right). 2. 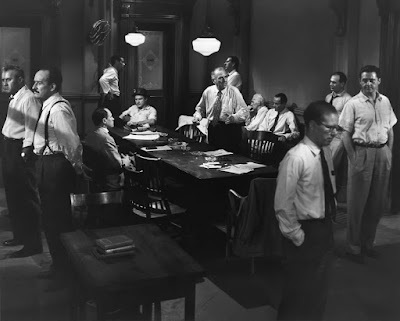 Cobb is mesmerizing in 12 Angry Men, airing at 9:45 p.m., as the rage-filled Juror No. 3. 3. On the Waterfront, airing at 11:30 p.m., is one of the best American films ever made, and Cobb is excellent as a mobster who rules the New Jersey docks. A great movie not featured during Summer Under the Stars: Cobb filmed a TV version of The Death of a Salesman in 1966. It's easily available on YouTube, and it's riveting. Old Hollywood video: Cobb shows off his tap dancing skills on The Dean Martin Show. Old Hollywood Archive: Cobb plays the patriarch of an Italian immigrant family in Golden Boy (1939). For more Summer Under the Stars articles, go here. There'll be plenty more on Cobb on social media. Follow me on Tumblr, Google+ or Pinterest or like us on Facebook. Follow us on Twitter @oldhollywood21.